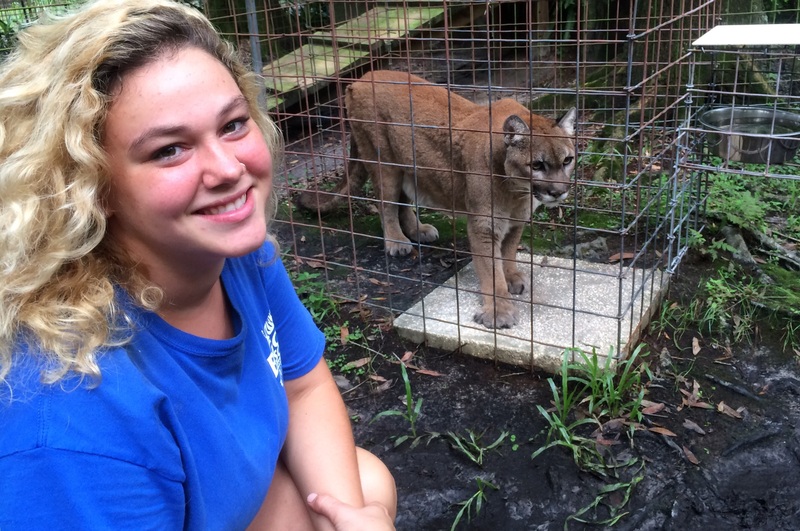 Chiara Vantaggiato ’16 interned for 12 weeks at the Big Cat Rescue in Tampa, Fla., a sanctuary for abandoned and abused big cats. Although her training only allowed her to work with smaller species, Vantaggiao earned a 10-week reward to do something at a higher level. This allowed her to take a picture with Reise the cougar, one of her favorite cats. Chiara Vantaggiato ’16 is definitely a cat person. A longtime pet cat owner, Vantaggiato has always been fascinated by their curious manner and delicate features. Her affection for felines combined perfectly this summer with her aspirations to care for the most impressive and endangered members of the species. Vantaggiato interned for 12 weeks at the Big Cat Rescue in Tampa, Fla., a nonprofit organization that provides a sanctuary for abandoned and abused big cats. Vantaggiato spent her summer preparing meals, feeding the smaller species of big cats, improving their habitats, moving them to different enclosures and even helping to shave a big cat under sedation. “This internship was the most intense experience I’ve ever had by far,” Vantaggiato says. 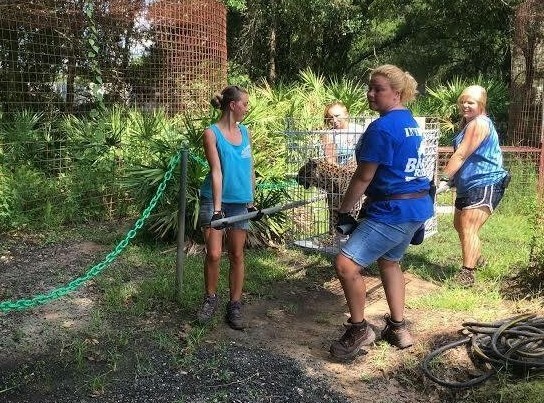 Chiara Vantaggiato, at right in foreground, helps move Jade, a female African leopard, into a new enclosure during her internship at Big Cat Rescue in Florida. Vantaggiato, who is pursuing a biology degree, plans to become a big cat veterinarian. A biology major in the College of Arts and Sciences, Vantaggiato is looking to pursue veterinary medicine and eventually work exclusively with big cats. This was the first time she had worked with big cats, and it gave her even greater resolve to pursue her passion. Along with owning several pet cats over the years, Vantaggiato grew up watching “The Lion King” and shows on Animal Planet, which led her to want to pursue a degree that would enable her to work with animals. Vantaggiato has also volunteered at a small clinic in her hometown of San Juan, Puerto Rico, and realized she enjoyed the hands-on work. Earlier this year, her mother passed along a video on the Big Cat Rescue organization and Vantaggiato began researching the organization that seeks to, along with caring for cats that have been in captivity, end the trade in big cats—eventually ending the need for sanctuaries. Vantaggiato applied for the internship and started in June. Part of the work involved moving the animals to different enclosures to give them new enrichment or place them in an expanded enclosure. 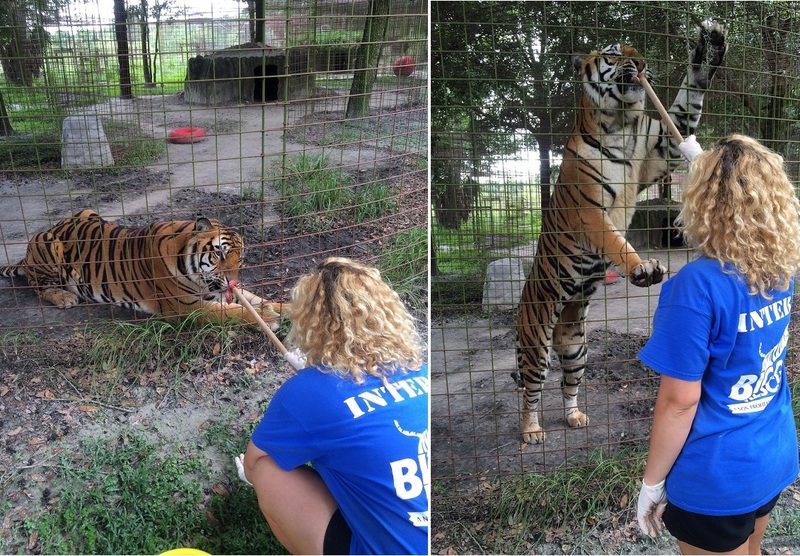 During her third week, she helped move a former circus tiger, Bengali, using an approved crate. 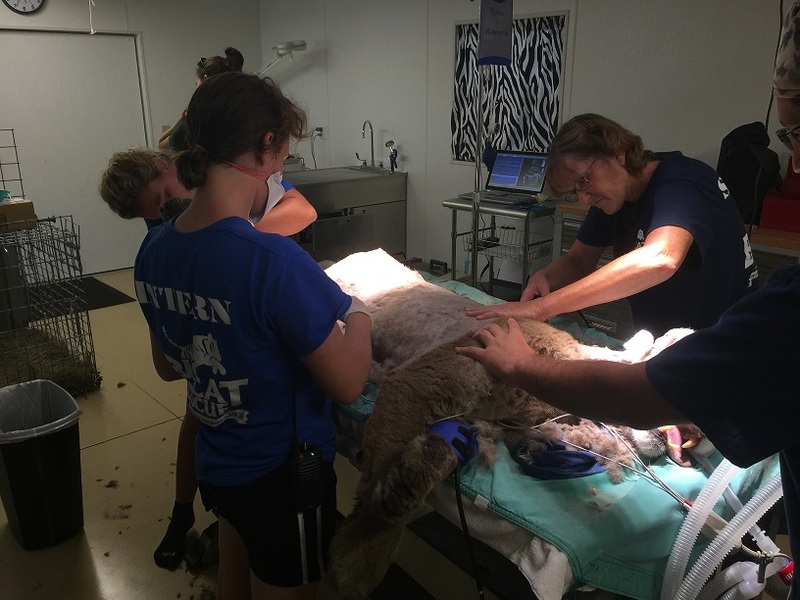 Chiara Vantaggiato, in background at end of table, assists in shaving Sassyfras, a male cougar, during her Big Cat Rescue Internship. Vantaggiato was also present during exams, including one for an older cougar named Sassyfrass, in which she worked with others to help shave his fur. The cougar can no longer groom himself adequately because of his age. “A couple of times a year, he has to be sedated and shaved. The veterinarian also gave him a basic cleaning of his mouth,” says Vantaggiato, who is shown participating in the work in the organization’s video on how to groom a big cat. The everyday work included cleaning small cat enclosures, guiding tours, landscaping, domestic cat care, daily chores, miscellaneous projects, enrichment and operant conditioning with the smaller cats, mentoring trainees and feeding small cats. The food is prepared the night before; every cat has a different diet, ranging from red meat, a hamburger-like meat called mush, fish, chicken and euthanized rabbits, rats and chicks. In dishing out the meals, Vantaggiato was assigned to a route that involved the smaller animals, with six bobcats, a savannah cat (a hybrid between a domestic cat and a wild serval cat) and 13 servals. Part of Vantaggiato’s internship was preparing and feeding the smaller species of cats. She puts together food here for a serval. The food is tossed into an access area that is reached by the animal through a door that has to be raised. “Some need to be distracted. For example, on days we had chicken necks, we throw one in, and while they chew, we put the rest of the food in,” says Vantaggiato, who can be seen preparing food and then feeding a serval in a Big Cat Rescue video about intern life. 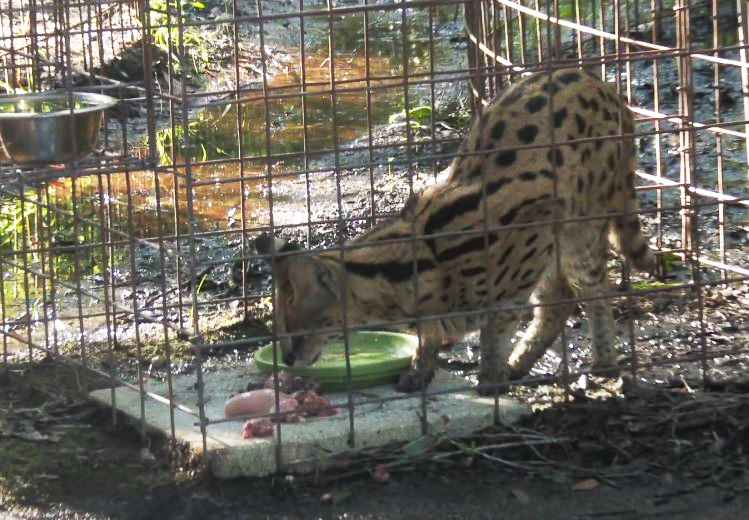 The serval enjoys his mealtime at the Big Cat Rescue. Another component of the sanctuary’s work is trying to ban the private ownership of big cats with the Big Cat Public Safety Act, which will be supported by someone in Congress and hopefully introduced in Congress shortly, Vantaggiato says. “If this gets passed, hopefully the trade will successfully end and the number of big cats kept as private pets will decline, and in 20 years it will hopefully be almost non-existent,” Vantaggiato says. There are an estimated 3,200 tigers in the wild and more than 5,000 estimated in the United States in captivity, Vantaggiato says. She wants people to know that no big cat should be kept as a pet. At the sanctuary, they are given enrichment, such as treats, toys and changes in their enclosures. “Even though we give them a more comfortable and nicer enclosure than other places, the sanctuary isn’t their true habitat,” Vantaggiato says. Although she was fond of all the cats during her time there, one in particular stood out—a cougar named Reise (the German word for “journey”). The cougar was born into the trade, purchased as a private pet and lived in a New York City apartment before being taken in as a rescue. “She was always playful when you walked by her cage” and at times played hide and seek as she walked by, Vantaggiato says. The cougar would hide behind vegetation or her den and Vantaggiato would hide behind golf carts parked next to her enclosure, before they each announced their presence. Chiara Vantaggiato works with Arthur as part of her 10-week reward to participate in a higher-level skill during her Big Cat Rescue internship. The feeding is part of operant conditioning in the up and down position, which is useful for the veterinarians to check on the cat’s health.